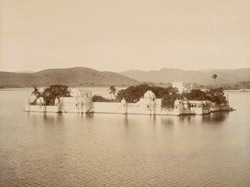 Photograph of Jag Niwas from the 'Reading Collection: Views of Udaipur taken by an unknown photographer c.1910. The photograph is part of an album containing architectural and topographical views of sites in Rajasthan, mainly of Udaipur, originally in the collection of Rufus Daniel Isaacs, Lord Reading, who served as Viceroy of India (1921-1926). Jag Niwas is one of several beautiful lake palaces at Udaipur, built by the rulers of Mewar, the Sisodia Rajputs, as summer retreats and pleasure pavilions. They stand on small islands in Lake Pichola, an artificial lake created in the 14th century, and appear to float on the surface of the water. The Jag Niwas lies in the middle of the lake and consists of a complex of white marble pavilions set in gardens with courts, fountains and trees. It was built by Jagat Singh II (r. 1734-1751) and dates mainly from 1754 with later additions. It was once the summer residence of the rulers of Mewar but is now the Lake Palace Hotel, one of the most romantic and famous hotel-palaces in the world. This view shows the whole of the island in the lake, with trees rising above the domed kiosks of its perimeter walls and the Aravalli hills in the distance on the far side of the lake.